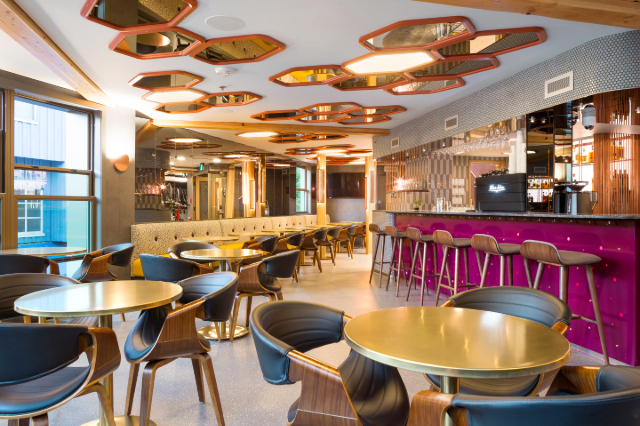 Bricault Design makes sure “every centimetre counts” for a new high-concept hotel in Whistler. Drawing heavily on the Japanese model of micro-suites for salarymen, Vancouver-based Bricault renovated a drab 1970s time-share apartment block into 88 sleeping pods for Whistler’s visitors combined with a vibrant public bar and eatery. Design problem-solving is evident throughout: separate gear storage rooms morph depending on the season, and the café lounge provides important communal space that extends living space for guests outside of the sleeping pods. Situated in the heart of Whistler’s pedestrian village, Pangea is located steps from the resort’s chairlift stations. Pods are grouped into suites that include their own amenities such as washrooms, showers and change rooms. Owners Russell Kling, an entrepreneur from Cape Town and wife Jelena Kling, a biochemical engineer from Belgrade, are new to the hotel industry. Their venture is “inspired by years of traveling the globe.” The designers worked with the clients over three years to create this accommodation solution, which they are calling “Canada’s first pod hotel.” Murals by Ola Volo back the reception counter with self-check-in stations. The Living Room is designed as important communal space with unique design elements such as copper-plated covers for the custom column lights that accent and extend this shared space for guests outside of the sleeping pods. The ceiling design utilizes a variety of tinted mirror along with topography lights, which Marc Bricault explains “create greater sense of space and facilitate a conversation between the ramblers on the village stroll and the activity in the second story restaurant bar.” Wallpaper and way-finding designed by Bricault is used to highlight the upper portion of the walls in suites and corridors, much like the complex ceiling design of The Living Room. A novel design solution to the classic winter and summer resort feature of the gear storage room; The Toy Box is multi-functional, secure, and like the sleeping pods, does not waste any space. Components fold and stow to accommodate a response to seasonal requirements. Reworking the building’s exterior within the Village of Whistler’s strict bylaws generated significant design challenges, such as improving visual appeal at street level.